We pride ourselves in providing something for everyone. Here at Coburn’s Exclusive we have our own in house paint shop, meaning we can experiment with different finishes and techniques to get unique, high quality finishes for our projects. We offer several finishes including powder coating, patinas, acid weathering, oil and wax rubs. One of the most popular finishes here at Coburn’s Exclusive is our blackened hot rolled steel. We use a proprietary blend of coatings to achieve a darkened look while still allowing the texture and variation of the steel to show through. This finish is perfect for indoor or outdoor use as the powder coat will protect the steel from the elements. We often choose this finish for projects like window and door framing as shown above. The variation in texture provides a unique look with subtle detail while keeping the main focus on the entire piece. We have also used this on large paneling, countertops, and product shelving. Our translucent brass finish is great for providing a subtle warmth to your piece without overpowering everything around it. As you can see in the photos, we have used it for accent panels as well as textured door pulls with our blackened steel to add a pop of color that sets this piece apart from its surroundings. As the lighting changes throughout the day, the brassy color will become more or less visible, giving the space an ever-changing feel without actually changing anything. 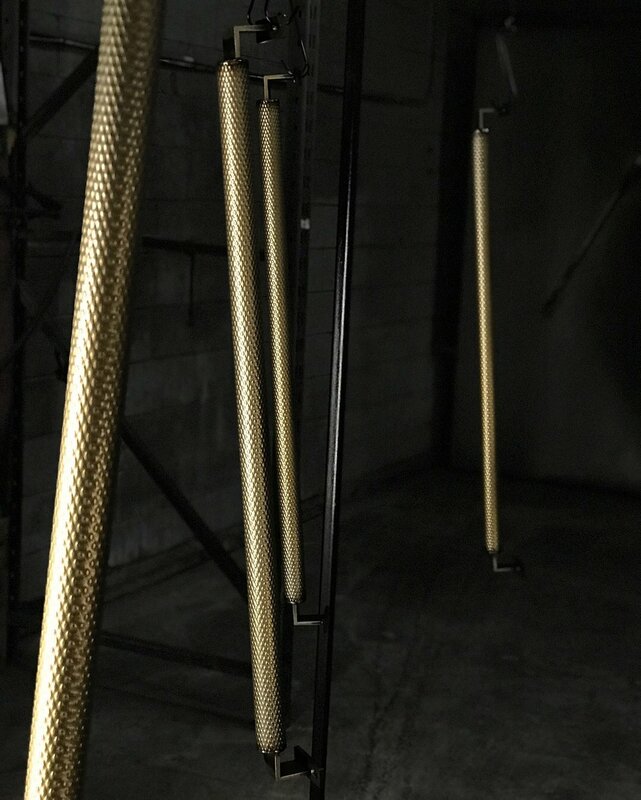 The translucent brass finish can be used indoor or outdoor, and on a wide variety of metals. Because this is a powder coat, it will hold up against rain and the brass color will never tarnish. Add some color to your next project with custom powder coating. With our own in house paint shop, we’re only limited by your imagination when choosing colors and finishes. For an even, glossy or matte finish, you may want to go with powder coating for your next project. Great for indoor or outdoor use, decorative or functional, powder coating coats the metal on both sides to help prevent scratches and water from rusting the metal underneath. We can powder coat any steel or aluminum project up to 16’. This raw corten steel is one of our favorites. We even chose this as the facade for the front of our shop because of the patina that naturally develops over time. What’s special about this finish is that the steel is formulated to develop a stable layer of rust on top that protects the metal underneath, preventing the need for painting or protecting it with additional processes. We work with a lot of metals, and brass is no exception. Next to concrete or reclaimed wood, brass adds the perfect modern touch to your industrial look, instantly giving the space a more current and complete feel. We don’t recommend using raw brass outside, as the weather will quickly tarnish and dull down the finish, but it is beautiful to have around the inside of your space. You will have to maintain the shiny finish with some polish and a cloth, but we think it is well worth it. Our antique bronze finish is a great option for indoor railing and decorative accents. This finish adds a weathered and industrial feel to any space, while warming it up with its natural copper-brown color as seen above. Since the finish is hand-applied, there will always be variation and differences from piece to piece, making each project one of a kind. Outdoors, the copper alloys in bronze will patina over time and develop a blueish green color on the outside. Don’t see what you’re looking for? visit us on instagram for more photos and don’t hesitate to contact us with any inquiries you may have.